Yes, it is TRUE! - DAZ 3D innovates again. Working closely with Smith Micro, DAZ 3D has created a way for Poser users to seamlessly install and load the most popular Genesis figures such as Victoria 5 and Michael 5 into Poser. Poser users can now install, load, and interact with Genesis figures very much like any other native Poser models. Now Poser users can enjoy the benefits of the award-winning Genesis Figure Platform. DAZ has converted the most popular Genesis products (with many more to come) to DSON compatible file formats. The DSON Importer for Poser reads the new file formats and loads the Genesis Models directly into Poser. No runtime conversion is necessary. Once the DSON Importer for Poser is installed, users can install and load DSON compatible products into Poser with no additional steps. To find DSON compatible figures and products look for the DSON Importer for Poser Notation or Visit this category. A: DAZ Scene Object Notation – DSON is a new file format definition (introduced in DAZ Studio 4.5) from DAZ 3D designed to enable scene and content compatibility between 3D software applications. 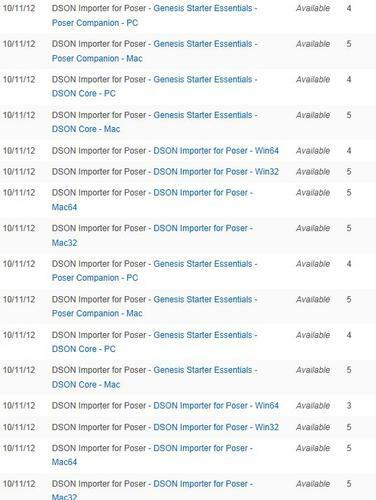 Q: How do I get the DSON Importer for Poser? A: Click Here Now to get it FREE for a limited time. Q: Are all Genesis based products compatible with Poser? A: No. Genesis products must be created in or converted to DSON Importer compatible file formats. DAZ 3D has already converted dozens of its most popular products into DSON Importer compatible file formats and many more are coming soon. In addition, DAZ Published Artists are currently creating new products in DSON file formats that will also be available soon. Q: Do I need DAZ Studio? A: No. The DSON importer for Poser works completely separately and distinctly from DAZ Studio. The DSON Importer for Poser is a Poser add-on that installs to Poser. Q: Are ALL Genesis features supported in Poser? A: No. Some Genesis features such as collision detection and smoothing are dependent upon and function only in DAZ Studio. Q: When I buy a DSON compatible product for Poser do I have to get DAZ Studio files too? A: DSON compatible products include the user files common to both DAZ Studio and Poser. In addition, “companion” files are included that Poser uses to correctly load the content. Q: Where can I learn more about the DSON Importer for Poser? Remember to download the new Genesis Starter Essentials files that include companion and core files. These are needed to run with this tool. Good to hear. I am sure this will make people happy. Those version don't have weightmapping capabities, you'll have to upgrade. Edit: Also those don't have the plugin interface SM opened up in SR3. Note the 2nd line, they note a Mac or PC version. Also the different files do have different names. Look close. You will need to get the latest Genesis Starter Essentials 1.6, and the other Genesis content will be updated as it can be. You'll need to re-download/reset your files as they are updated. We plan to update the genesis content as we can. Yes... please many of them have been updated with the Poser companion files. Others will be coming soon. Should DAZ Studio users update to the new 14812_GenesisStarterEssentials_1.6_trx.exe? Or is that only for Poser users? Refresh your page. I had the same problem. It's a cache issue with the browser. Give it a try. You can update the starter essentials is you want. But it will still work with the latest DAZ Studio 4.5.1.6 that is now available to update in your downloads. It looks like for Win 64 version I need these 3 files - is that correct? A new olive branch from Daz3D to Poser users, and its not eleven pages of complaints. I tried hitting the refresh button and even deleted cookies, but it still won't work. I tried adding it to my cart again and it gives me the message that the maximum limit is one. Congrats on this and thanks for doing it ! Extra kudos for having several Daz employees in the thread answering questions. I do wish there was an easier option than finding and re-downloading all of our Genesis content to get the new updates - is that a possibility? It's time for bed here, so I can't try it tonight. But I have downloaded it.